Federal civil-rights legislation addressing the needs of physically impaired citizens. Sections dealing with signage include Title II, affecting government and public sector activities, and Title III, involving the private sector. Additional rules are included in the ADA Accessibility Guidelines (ADAAG). A sign made of wood, cardboard, plastic, or other lightweight and rigid material having the capability to stand on its own support(s) and being portable and movable. A sign in that is fabricated from aluminum tubing with an aluminum skin face, or an aluminum panel that is broke (bent) at the sides to give depth. Dimensional letters cut from aluminum plate. Also known as Flat Cut Out Letters or FCO. Any sign that uses movement or change of lighting to depict action or create a special effect or scene. A shelter constructed of non-rigid materials on a supporting framework which projects from and is supported by the exterior wall of a building. An awning may or may not be illuminated and/or decorated with graphics to serve as a sign. A building mounted sign that provides additional functionality as shelter. A sign consisting of a cabinet containing a light source surrounded by one or more translucent faces, illuminated for visibility. A sign usually made of fabric, vinyl or other non-rigid material with no enclosing framework. May be painted, screen-printed, digitally printed or decorated with vinyl. A sign composed of lightweight material. Promotional banners include those used to announce open houses and grand openings, make special announcements, or communicate events. Ornamental banners use images or colors of a decorative nature. A form of tactile signage consisting of raised symbols that enabling visually impaired and unsighted people to read and write. Braille is broken into two grades: Grade 1 Braille involves a character-by-character translation of printed material; Grade 2 Braille uses special contractions (much like the phonetic parts of speech) for messages. Grade 2 Braille is required by federal law according to the Americans with Disabilities Act (ADA). A system of small raised dots that represent the alphabet, punctuation and numbers for the visually impaired. The ADA stipulates the use of Braille on signage in certain instances. A small, pedestrian-oriented sign that projects perpendicular from a structure. A sign placed on a wall, awning, canopy, parapet, or a blade bracket. Also see Wall Sign, Canopy Sign, or Bracket Sign. A sign placed on a wall, awning, canopy, or parapet, or a projecting sign. An electric sign, not including the components and structure. A cabinet is made up of a face and back, or two faces, along with the edge. (Also called can.) A sign structure consisting of the frame and face(s), not including the internal components, embellishments or support structure, the frame or external structure of a box-like sign that encloses the various functional elements of the design, whether electrical or dimensional components. A sign which contains all the text and/or logo symbols within a single enclosed cabinet that is mounted to a wall or other surface. Any sign that is a part of or attached to an awning, canopy, or other fabric, plastic, or structural protective cover (excluding a marquee) over a door, entrance, window, or outdoor service area. Signs in which letters or shapes are incised or relieved in the sign substrate surface. Today the majority of carved signs are created with the aid of CNC routers, but they can be hand done. Common substrates include hardwoods and HDU. The outline of a letter, with extended sidewalls that creates depth, into which a light source is placed. Fabricated or formed three-dimensional letter that may accommodate a light source. A sign comprising individual letters that are independently mounted to a wall or other surface and internally illuminated with a covered face. The “air space” between the letters is not part of the sign structure but rather of the building façade. A logo may also be considered a channel letter provided it is clearly distinguishable from other sign elements. A sign or portion thereof with characters, letters, or illustrations that can be changed or rearranged manually without altering the face or surface of the sign. A sign on which the message or characters change more than 12 times per day shall be considered an animated sign and not a changeable copy sign for purposes of this Title. Cover material applied over the framework of a structure. In graphic design, the use of dissimilar or opposing elements, such as light and dark areas. Also, a term describing the difference between elements within an image in terms of their relative lightness and dark. An off-premises sign located on a public street or public way that is part of a City-sponsored and coordinated program for the purpose of providing tourists, travelers, and others of the public ways in the City of Manteca with information and guidance concerning public accommodations, facilities, commercial services, and points of scenic, cultural, historic, educational, recreational, religious interest, and other local community destinations as designated and recognized by a City Community Directional Signs Program. A temporary sign directly connected with a construction project; may include the construction company’s name, addresses, and/or telephone number. The words, letters, numbers, figures, designs, or other symbolic representations incorporated into a sign. White vinyl film with printed graphics, which is then applied to another surface. Typically used when complex logos are used. A specification description of a letter, logo or symbol, cut out, cast, molded or fabricated in material such as metal or plastic to create a raised condition. An on-premise sign that identifies the names and locations of tenants in a multi-tenant building, or group of buildings. Directional Sign: Signs designed to provide direction to pedestrian and vehicular traffic. Directory Sign: A sign that identifies the names and locations of tenants in a multi-tenant building or in a development made up of a group of buildings. Any sign intended to be permanently affixed and utilized only for the purpose of indicating the direction of any object, place, or area. A sign with two parallel but opposing faces. A form of signage using plasma display panels (PDPs), liquid crystal displays (LCDs), light emitting diode signs (LEDs), and/or television (CRTs) in place of traditional signage. Content can be instantly updated, and multiple screens can be networked and managed from a single location. A sign that utilizes computer-generated messages or some other electronic means of changing copy. These signs include displays using incandescent lamps, LEDs, LCDs or a flipper matrix. Also called changeable message signs (CMS). A variable message sign that utilizes computer-generated messages or some other electronic means of changing copy. An electronic sign, typically comprising a liquid crystal diode (LCD), light-emitting diode (LED), plasma, or other digital illuminated display that contains one or more messages. An electronic message sign is different from an illuminated sign in that the illumination of the display creates the message, rather than an internal or external light source illuminating the message. The process of producing raised letters, particularly those produced by engraving dies or plates. Method of marking metal, plastic or glass in shallow, negative relief utilizing a bit or graver. Engraving may be done freehand, using a pantograph or computer-driven equipment. Neon that has no protective covering or enclosure. A sign that is illuminated by a light source that is directed towards, and shines on the face of a sign. A sign that is not subject to a Sign Permit. The front or principal entrance of a building. The decorated surface of a sign; the area on which the copy and art is placed.The surface area on a sign where advertising copy is displayed. A change in color, material, copy, graphics, or visual image that requires the installation of a new or modified sign face, but which does not involve any change to an existing sign structure or mounting device. An illuminated channel letter with translucent face. Refers to using flat panel electronic display devices, such as liquid crystal displays (LCDs) or plasma screen in place of traditional signs. 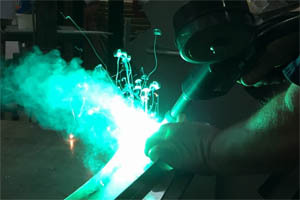 Electric-discharge lighting utilizing glass tubing manufactured to standard lengths. The (usually) concrete supporting base of a structure, as for a pylon or monument sign. Also called “footer”. A sign that is not attached to a building. A permanent sign that is self-supporting in a fixed location and not attached to a building. A freestanding sign can be connected or attached to a sign structure, fence, or wall that is not an integral part of a building. Freestanding signs include, but are not limited to, monument signs, pole signs, and pylon signs. Signs identifying the brand, type, octane rating, etc., of gasoline for sale, as required by state law. A method for measuring the thickness of sheet metal. In the sign industry, most sheet metal ranges from 10-26 gauges. Gold manufactured into thin leaves, commonly available in a range of from 10-23 karats. A ring of light. Usually refers to the reflection of light achieved by reverse channel letters, which appear to be ringed by light because the light source is reflecting on the background from which the letters are pegged-out. An illuminated reverse channel letter (open or translucent back) so light from the letter is directed against the surface behind the letter producing a halo lighting effect around the letter. Also referred to as Silhouette lighted or halo lighted. Short for high-density urethane is designed for three dimensional signage applications, most commonly sandblasted. A sign, which is lighted through the use of internal electric fixtures or lamp-banks. See also Backlit Sign and Exterior Illumination. A sign that is illuminated by a light source that is contained inside the sign. A sign with an artificial light source incorporated internally or externally for the purpose of illuminating the sign; includes signs made from neon or other gas tube(s) and LED’s that are bent to form letters, symbols, or other shapes. An illuminated sign excludes electronic message signs, which are separately defined. A channel letters mounted flush with the building fascia. Power supplies are either remote or self-contained in the letter itself. Brand of trim cap for channel letters. Announces project credits and information regarding a construction project such as architect, developer, consultants, financing, etc. The process of moving pairs of letters farther apart or closer together to make them appear more evenly spaced. The total arrangement of a sign’s graphic and copy elements. Thin flat screen video displays commonly used for TV, computer monitors, wristwatches and electronic digital signage. LCDs contain two thin transparent surfaces (usually glass), with grooves full of a liquid crystal substance. Thin film transistors (TFTs) on the surface material apply an electric current to the liquid crystals. This current polarizes the crystals, making them twist and thus block light. When off, the liquid crystals go into random alignment and let light pass through. A semiconductor diode that emits light when voltage is applied; a solid state lighting component, used in signage for EMCs, channel letter illumination, edge lighting glass or acrylic panels or for various decorative lighting effects. LED: short for Light Emitting Diode, A small electronic device that emits light when electrically charged. Fabricated or formed three-dimensional letter that is accommodated with LEDs as a light source. A trade name for polycarbonate plastic sheeting. A slim cabinet with internal lighting, used to backlight translucent graphic displays. Any permanent roofed structure projecting over public property or right-of-way, attached to and supported by a building. A changeable point-of-purchase advertising display that allows the retailer to list products and prices. In screen-printing, the material stretched across the frame. Also referred to as the fabric. Any sign that displays changeable copy through electronic or mechanical means. In an electronic sign, the device that stores messages and conveys them to the display area. A freestanding sign sitting directly on the ground or mounted on a low base. A freestanding sign that stands directly on the ground or ground level foundation. A monument sign is often used to mark a place of significance or the entrance to a location. A freestanding sign that is detached from a building and having a support structure that is a solid-appearing base constructed of a permanent material, such as concrete block, brick or aluminum. All other freestanding sign types not meeting the definition of a monument sign shall be either a pole sign or a pylon sign. Multimedia signs are a growing trend in the signage industry, where televisions or flat panel display devices such as plasma screens or liquid crystal displays, are turned into updatable signage. Advantages of multimedia signs include the ability to deliver messaging to targeted audiences depending on schedule or environmental conditions. For example, advertise umbrellas when it’s raining. A painted or otherwise attached or adhered image or representation on the exterior of a building that is visible from a public right-of-way or neighboring property, does not contain commercial advertisement (is noncommercial in nature), and is designed in a manner so as to serve as public art, to enhance public space, and to provide inspiration. A rare inert gas which, when an electric current is discharged through it, produces a reddish-orange glow. The word neon is also often used synonymously to describe a type of luminous tube sign, which may contain other inert gases such as argon. Electric discharge, cold cathode tubing manufactured into shapes that form letters, parts of letters, skeleton tubing, outline lighting, and other decorative elements or art forms, in various colors and diameters and filled with inert gases. Fabricated or formed three-dimensional letter that is accommodated with neon as a light source. A channel letter that has no face and in which the neon tubing is visible. A channel letter with returns that project forward from face of letter such that the neon tubing is visible. A clear face for physical protection of internal components may be used. In electronic digital signage, a page is what is shown on a screen in any given moment. In printing and plotting it is the production area of the printer or plotter. Also called a panel. A sign that comprises only paint applied on a building or structure. A numbering system for identifying 3,000+ colors created through combinations of 14 base colors. The Pantone Company produces numerous color-matching systems for standard print and computer applications. In sign making, a full-sized layout of the work to be done. A sign that is entirely constructed out of durable materials, is fixed in place, and is intended to exist for more than 120 days. A sign painted, attached, glued, or otherwise affixed to a window or located within 3 feet of the interior side of a window or otherwise easily visible from the exterior of a building. A type of flat screen display device that is used for television, computer monitors, and dynamic signage. Similar to an LCD panel, they consist of two layers of glass surrounding cells of xenon and neon glass. Surrounding electrodes switch the cells on and off, causing them to emit light and create the picture. This emitted light makes PDPs have an appealing vibrancy that competes with Cathode Ray Tubes (CRTs), the technology of traditional televisions. Also known as gas plasma displays or plasma displays. Channel letter in which the front of the channel is covered by plastic material or facing, hiding the neon tube from view. A drawing or sketch showing the layout looking down on the site on which a sign is to be erected. Device that interprets information sent from a computer and moves a tool head to a series of coordinates based on the device’s X and Y-axes. Sign makers use a plotter equipped with a knife to cut vinyl, with the X and Y coordinates forming an outline that can be weeded and installed on a surface. A freestanding sign, usually double-faced, mounted on a round pole, square tube or other fabricated member without any type of secondary support. A freestanding sign in excess of six feet in height that is detached from a building and is supported by one or more structural elements that are either: (a) architecturally dissimilar to the design of the sign; or (b) less than 1/4 the width of the sign face. 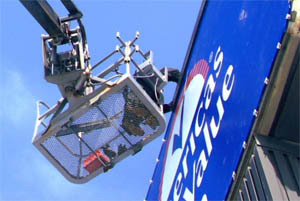 A type of plastic used in sign faces, noted for its heat-resistance and impact strength. A traditional type of metal sign utilizing porcelain enamel paints topped by a ceramic slip to create a durable, glass-like surface that’s impervious to the environment. A freestanding, on-premise sign that is not designed to be permanently affixed to a base. Any sign not permanently attached to the ground or other permanent structure, or a sign designed to be transported. Portable signs include, but are not limited to, signs designed to be transported by means of wheels, A-frame signs, menu and sandwich board signs, and advertising flags. Clothing or other aspects of personal appearance are not part of this definition unless otherwise fitting the definition of a human sign. A series of paper sheets printed for use on a billboard. Also, a type of sign, typically printed on paper, and intended for indoor use. Electrical wiring that directly connects a device, such as a neon transformer, to the breaker box. A sign that is attached to a building but extends beyond the building structure. Projecting Sign. A sign attached to and extending outward from the face of a building. Includes, but is not limited to, a blade sign, bracket sign, or marquee sign. A sign comprising individual letters that are independently mounted to a wall or other surface. Such sign may be illuminated by an external light source, such as pendant lighting. The “air space” between the letters is not part of the sign structure but rather of the building façade. A letter or graphic, which is cut out, then pushed through a corresponding space that has been removed from the sign substrate. A letter or graphic, which is cut out, then pushed through a corresponding space that has been removed from a sign substrate. The push-through is typically different color and/or material than the rest of the sign. Typically used with an opaque sign cabinet and internal lighting. “Push-thru letters” are most often translucent acrylic letters that are pushed through a sign face panel to be flush or over-flush with the front surface of the sign face. The most common form of plastic in use today. PVC is extruded or cast as sheets, tubing or films. PVC films are commonly referred to as vinyl. Any freestanding sign that is not a pole or ground sign. A freestanding sign in excess of eight feet in height that is detached from a building and is supported by one or more structural elements which are architecturally similar to the design of the sign. A metal structure enclosing the electric components of a sign. A metal structure enclosing the electric components of a sign, may also serve as a mounting structure for the sign. A channel letter that is mounted to a raceway. The quality of a sign’s overall design that allows the viewer to correctly interpret the information presented on it, and the optimum time and distance in which this can be done. Letter size and style, color contrast between the letters and background, and a sign’s layout all contribute to readability. A sign on which copy can be changed manually. It usually consists of a panel on which individual letters or pictorials are mounted. Like a window sign, it can advertise special prices or items. It can also be placed so that it can be easily seen from a passing motor vehicle. In neon and LED signage, to maintain a constant output level of voltage (or current in some supplies) regardless of input voltage changes and/or output load changes. Signs installed by various government bodies to acquaint the public with traffic laws and other regulations. A method for changing the messages on electronic changeable copy signs where the data is provided to the control console by telephone. In sign making, the slotted portion of the edge that holds a translucent face within a sign cabinet. Also, the projecting rim around a sign face that holds it in place. A framing member mounted around the perimeter of a sign face, and attached to the sign cabinet structure. It is designed to attach the face to the cabinet and/or intended to provide a decorating trim piece. A channel letter that has a face and sides but no back. It is pegged out from a background surface. When the inside of the channel is lit, it produces a halo effect around the letter. A fabricated dimensional letter with opaque face and sidewalls. A sign comprising individual letters that are independently mounted to a wall or other surface, with lights mounted behind the letters that face the wall behind. Lights illuminate the space around the channel letters rather than the channel letters themselves, creating a “reverse” lighting effect (e.g., halo effect). The “air space” between the letters is not part of the sign structure but rather of the building façade. A sign erected, constructed, painted, or placed upon or over a roof or parapet wall of a building and which is wholly or partly supported by the building or roof structure. A sign that has the ability to turn 360 degrees because of the presence of an electric motor to drive its moveable parts. All or a portion of the sign may revolve at a steady or variable speed depending on the sign. The three primary additive colors used by monitors and scanners for transferring and representing color data. In digital imaging most input and display are seen in RGB, while printed output is created using subtractive CMYK colors. Any high-quality electronic screen display that makes use of primary RGB colors to produce a full-color display. For example, some electronic message centers achieve full color by utilizing red, green and blue LEDs. In electronic digital signage, RSS (most commonly translated as “Really Simple Syndication”), is a family of Web feed formats used to publish frequently updated works such news headlines, stock updates, weather reports and the like. An RSS document (called an “RSS feed”, “Web feed”, or “channel feed”) includes full or summarized text, plus metadata such as publishing dates and authorship. In sign-making a router is a machine tool that mills out the surface of metal or wood, usually equipped with various bits and able to remove material along the X, Y and Z-axis. In digital signage a router is a networking device whose software and hardware are usually tailored to the tasks of routing and forwarding information. For example, on the Internet, information is directed to various paths by routers. Elimination of material in a substrate by and or computer aided with a CNC router. Technique used primarily in aluminum faces in which the negative spaces opaque while the copy is illuminated. • An outdoor sign used as advertising for hire, e.g., on which display space is made available to parties other than the owner or operator of the sign or occupant of the parcel (not including those who rent space from the sign owner, when such space is on the same parcel or is the same development as the sign), in exchange for a rent, fee, or other consideration. A sign that directs attention to a business, profession, commodity, service, or entertainment conducted, sold, or offered upon the lot or parcel on which the sign is placed. 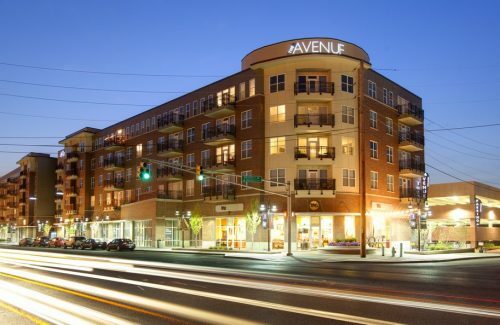 In the case of multiple-tenant commercial or industrial development, a sign is considered on-site whenever it is located anywhere within the development. In the case of a duly approved Uniform Sign Program, a sign anywhere in the area controlled by the program may be considered on-site when placed at any location within the area controlled by the program. A method for sign production common with wood, HDU, and glass. A rubberized stencil of the artwork is computer cut and applied to the substrate, which is then sprayed with a pressurized stream of sand to texture the unprotected area. Refers to a smooth, glossy finish. Refers to a sign made of a clear substrate, such as glass or acrylic, where the art is done in reverse on what will be an interior face of the sign, providing extra protection. Lists of all the signs to be installed, the locations where they are supposed to be placed and the information they should contain. Supplied by the architect, designer or contractor on major projects. • Interior Signs. Signs or other visual communicative devices that are located entirely within a building or other enclosed structure and are not visible from the exterior thereof or are located at least three feet from the window on the interior of the structure. • Architectural Features. Decorative or architectural features of buildings (not including lettering, trademarks, or moving parts). • Symbols Embedded in Architecture. Symbols of noncommercial organizations or concepts, including, but not limited to, religious or political symbols, when such are permanently integrated into the structure of a building; the definition also includes foundation stones and cornerstones. • Personal Appearance. Items or devices of personal apparel, decoration, or appearance, including, but not limited to, tattoos, makeup, wigs, costumes, and masks (but not including human signs). • Manufacturers’ Marks. Marks on tangible products that identify the maker, seller, provider, or product and which customarily remain attached to the product even after sale. • Fireworks, Candles, and Artificial Lighting. The legal use of fireworks, candles, and artificial lighting not otherwise regulated by this Title. • Mass Transit Graphics. Graphic images mounted on trains or duly licensed mass transit vehicles that legally pass through the City. • Vehicle and Vessel Insignia. As shown on street-legal vehicles and properly licensed watercraft: license plates, license plate frames, registration insignia, noncommercial messages, messages relating to the business of which the vehicle or vessel is an instrument or tool (not including general advertising), and messages relating to the proposed sale, lease, or exchange of the vehicle or vessel. • Gravestones and grave markers. • News racks and newsstands. • Shopping carts, golf carts, and horse-drawn carriages. • Vending machines that do not display off-site commercial messages or general advertising messages. • Graphic images that are visible only from above, such as those visible only from airplanes or helicopters, but only if not visible from the street surface or public right-of-way. • Holiday and cultural observance decorations that are on display for not more than 45 calendar days per year (per parcel or use) and which do not include commercial advertising messages. That area or portion of a sign on which copy is intended to be placed. A horizontal area above a multi-tenants’ building’s entrances, architecturally designed to accommodate signage in a sign centric manner. A sign consisting of one face, rather than back-to-back faces. A sign added to a structure where it is neither the main nor permitted sign. Any device used in mounting letters or signs which separates them from the surface to which they are being installed. any device used in mounting letters or signs that separate them form the surface to which are being installed. Insulators that support a neon tube, as well as hold it away from the background surface and provide some impact resistance. Also called tube supports. In electronic digital signage content, an event that is not associated with a file. Special events can be added like pages in the main menu, or like elements in the list menu. They are used to control a device or an element, for example, changing the volume of a sound. An extra-large outdoor sign that incorporates special lighting and/or motion effects, or an interior sales display that also includes special lighting and motion elements. In the sign industry, a structure designed for and capable of supporting a sign. The material out of which a sign face is made. Wood, metal sheeting, paper and acrylic are all sign substrates. In screen-printing and inkjet printing, a substrate can be any printable material, but usually some form of rigid sheet; or it may refer to a rigid mounting board. Insulators that support neon tube, as well as hold it away from the background surface and provide some impact resistance. Also known as stand-offs. Channels in a router or engraving-table surface that hold special clamps for holding-down substrates. The T-clamp goes into a slot like an upside-down “T”. A sign, or area within a larger sign, that conveys its message through raised or engraved art, making it accessible to the visually impaired. Term could be applied to Braille signage. Any sign that is not intended to be permanently installed, such as banners and construction site signs. Often, sign codes seek to limit the length of time a temporary sign can be in place. A switch that utilizes a clock or timer to automatically turn on and off electric signs at set times. Among the first electronic devices to change copy, these popular signs alternate between showing the time and temperature. Some also display simple messages. In electronic digital signage, data being transferred over a network. Downloading of text and graphics represent low-bandwidth traffic, while streaming video is higher. The estimated number of people who will see a sign in a given time period. Medium-tack adhesive-coated translucent paper, placed on weeded vinyl images still on the original carrier liner; the tack of the tape is stronger than the adhesion of the vinyl to the coated liner, so the image is pulled off the liner in a transfer to another surface. In neon displays, the mechanical or electronic component that transforms incoming voltage (primary voltage) into a higher voltage (secondary voltage). Also an electrical component with two or more sets of wire windings separated by some insulation material. The windings are wound on a magnetic core to magnetically couple energy between the winding. Transformers only work with a changing voltage. They act as a virtual electrical short if you apply Direct Current (DC) to them. They may be designed to work on line frequency AC (50Hz or 60Hz) or high frequency (greater than 20KHz) in a Switch-Mode power supply. They provide voltage scaling and galvanic isolation. The property of a substrate, vinyl, paint or ink to allow the passage of some light through it without being completely transparent. A type of sign consisting of rotating triangular louvers. The louvers turn in unison, showing three different messages as the three faces as exposed. Tubing for neon signs is produced as a clear glass, or in colors. Different tube colors serve as filters that only allow the desired to color to shine through. In many cases the only way to achieve rich primary colors is through colored glass. A standardized steel post with pre-drilled holes for easy sign installation. Private organization that tests electrical devices and their construction and certifies their safety. A system of signage and graphics, which is designed to give direction to a given destination. While the copy and graphics on a building’s signs are important to the process, Wayfinding also depends on the information inherent in a building’s design. In cut-vinyl sign making, the process of peeling extraneous vinyl (or matrix) away from a plotter cut, leaving only the sections representing the final image. Pulling the extra vinyl away in one quick stroke is known as rip weeding. A small opening or hole in the bottom of a letter or sign cabinet, placed at the lowest ping to prevent water form accumulating in a unit. A method where a government body deviates from the terms of its sign or zoning code. Typically, obtaining a variance for a sign requires the applicant to show that it would not be contrary to the public interest or where, owing to conditions peculiar to the property, a literal enforcement of the regulations would result in unnecessary and undue hardship. Function of tracing around a bitmap image to create an outline comprised of line segments, or vectors. Also called auto-tracing. The most common form of plastic in use today. See PVC. A single-face sign mounted on a wall. Another name for a wall sign.